We offer a fun and exciting way to experience Uluru / Ayers Rock. What do we do at Uluru Segway Tours? We tour around the whole base of Uluru on Segway!! To learn more about our Uluru tours – click here or download a copy of our brochure. Once you’ve arrived on your flight to Ayers Rock and are checked into your Uluru accommodation, it’s time for some fun. Therefore it’s time for your Uluru tours. Rather than walking the base of Uluru you can cruise it in style on a Segway. You have the choice of self-driving to Uluru or booking a transfer from your Uluru Accommodation within the Ayers Rock Resort. To learn more about accommodation and surroundings at Uluru – click here. 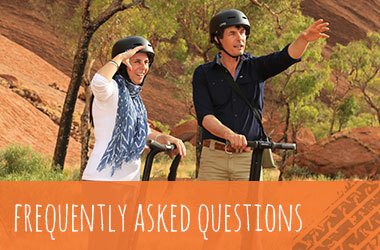 When it comes to experiencing Uluru, we believe the best way to do it is on Segway. Seeing the entire base of Uluru on a Segway is fantastic. It allows you to easily cruise the full base of Uluru, in less time than it takes to walk. On Segway you can even travel faster than the flies. Join us for a fully guided Segway Tour. If your not convinced here are a few reasons why we thing Segway tours are the best! Firstly our fully guided Uluru tours are really fun. Secondly our tours are intimate, we offer small group touring. This allows you to get up close and personal with the rock. Finally you can cruise with us experience the full base of Uluru and not even break a sweat!! Don’t miss out. Book today to join our fully guided Segway Uluru tours, and see it all!